The view south from the Ellsworth Street Bridge. Everyone driving across Albany’s Ellsworth Street Bridge can see there’s a house on top of the Bikman Building. Newcomers wonder why it’s there, and on Facebook someone asked about it a few days ago. The short answer is that the Bikman family built the house so they could live atop the building they owned. But I went looking for more. I checked what I could find online, including the obituary of George Yale Bikman, one of the Bikmans’ five chidren, who was 91 when he died on the first day of 2005. Then I visited the Albany Regional Museum and also asked what the city of Albany had in its collection on historical buildings. And at the Waverly Cemetery, which is on my favorite bike route, I found the graves of the couple who built not just that house but an American life. 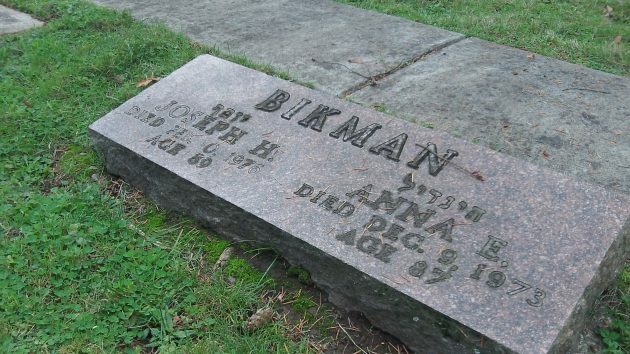 Joseph H. Bikman grew up in a place near Kiev in the Ukraine, and he learned the tailor’s trade. His family along with many others had witnessed and suffered under the repeated anti-Jewish pogroms of Tsarist Russia. So in about 1910, young Bikman took off for America. He must have been around 23. 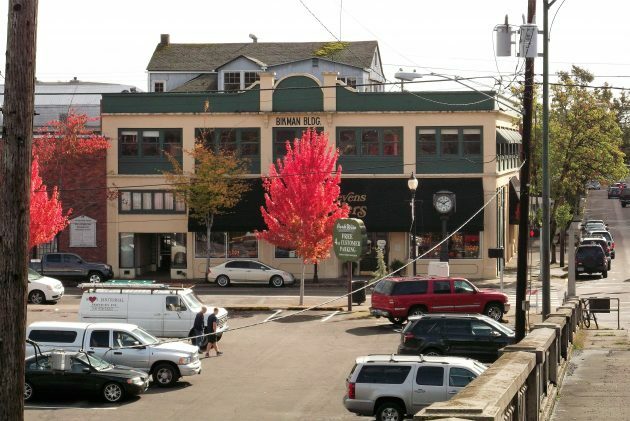 First he set up in Coos Bay, but soon he moved to Albany. He also sent word back home for Anna to join him, and she did. One source says Bikman built the building at First and Ellsworth to house his clothing store. Another says it was built in 1912 to house Woolworth’s. Yet another says it was built for Woolworth’s in 1924. One of the couple’s granddaughters understands that her grandparents added the penthouse in about 1926, and they and their five children lived there. But in one of the “Remembering When” books published by the late Bob Potts, photos of the building purporting to be from 1926 and 1928 show no penthouse on the roof. According to an “Ask Us” feature in the Sunday Democrat-Herald in 2007, the Bikmans moved elsewhere at some point and the penthouse was rented out. In 1979, French’s Jewelers leased the building with a stipulation that the house remain vacant for security reasons. After Sid and Susan Stevens bought the property in 1992 for their jewelry store, Sid told the paper they had hopes of remodeling the rooftop dwelling and living there some day. It hasn’t happened, though. A county assessor’s note from 2000 implied the penthouse was not livable, and there’s been no notation to change its status since. Joseph’s and Anna’s final resting place at the Waverly Cemetery. What a fun posting! I’ve often wondered about this structure. Never enough to investigate but now I know a wee bit more thanks to the answer man. It sure would be fun to have a peek inside. Visit and tour all the rooms. Halloween is coming. Haunting “penthouse” party? I’ll be waiting for my invite. Do you know if the Stevens still have any plans for the penthouse? I hope to ask them when they’re available. I have seen several of your posts on Facebook. You seem to make light of the things we all have questions about. Thank you for sharing. I look forward to reading more. Been in that place before Spangler and Harold used to live there back when we were in our early 20s long time ago it’s pretty big and old. Had nice back then all over the place. Neat Story. I really hope the penthouse is restored someday to usable living space, as it was originally intended. I always look forward to you posts. I learn a little more about this town every time you write a story. I always enjoyed your op ed pieces years ago when you were editor. Thank you for answering so many of my questions. I surely hope that the Stevens return the space to its former glory. It is such a lovely old building. Just wanted to add that George bikman was with me and my family the day my dad passed away and have the service at his funeral. Which my mother just reminded me.